Thank you for taking the time to visit our website. 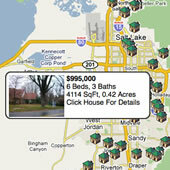 We specialize in assisting buyers and sellers in North Utah County and South Salt Lake Valley. Our website contains ALL listings from ALL Real Estate Agents in the state.